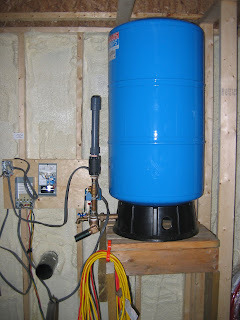 Similar to the tankless water heater we also rough-installed the pressure tank for the water system. Again this early installation was done so that the electrician would know were to install the electrical connections. By way of describing what you are seeing in the picture, here are some features of this pressure tank. All those wires and electrical looking boxes make up the controlling system for the pump. When the pressure in the tank drops to a certain level the controller tells the pump to send more water. The water intake is at that short pipe (ABS) stub about center of the picture. In the bottom left you see the exit pipe of the waste system to the septic tank. The pump is in the lake so we are employing a drain back system - that is so the water doesn't freeze in the pipe in the winter. The vertical grey assembly to the left to left of the tank and attached to copper piping connecting it to the tank is used to vent the pipe during the drain back operation.